Colombia El Peñol is back! This coffee was one of my favorite offerings from 2014, in fact, I created one of my favorite pairings with this coffee (which never made it to the blog. Maybe I’ll recreate it with this new offering!) This coffee randomly appeared on the scoop bar at the Roastery for a short time in mid October, and is the subscription coffee for the month of December. This coffee is elegant and balanced with notes of black currant and a touch of bittersweet chocolate. While I was in Sacramento, I came across a lot of very old recipes, and I have been having fun recreating them, and breathing new life into them. 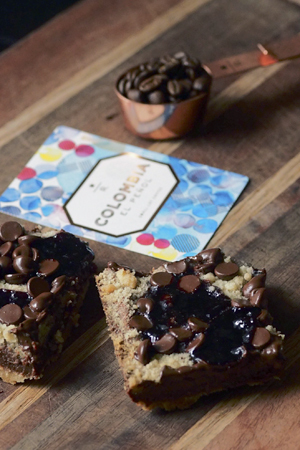 The jam bars are very easy to make, and are the perfect compliment to Colombia El Peñol! 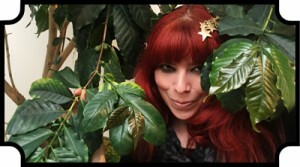 Colombia El Peñol is a washed coffee with a medium body and acidity. It is delicious hot or iced. I personally enjoy it brewed with the chemex (hot) or as a cold brew. Preheat oven to 350 degrees. Spray a 9x13" pan with non-stick cooking spray. Add the flour, sugar, salt and the cold butter into a food processor. Process until coarse crumbs are formed. Set aside 1 ½ cups of the mixture for the topping. Press the remaining crumbs into the bottom of the prepared pan. Bake for 12 minutes or until light golden brown. Bake for 35 minutes, until filling is set. Let cool completely in pan, and then cut into squares. « #colorthecoffee downloads are here!